In an event today in San Francisco, Google executives announced some of the worst-kept secrets in tech since the iPhone 7 turned out to exist. And although everyone expected the Pixel phone and Google Home to be today’s showcases, Google still managed to cram a whole lot into its 90 minutes… including a whole lot of not-so-subtle digs that anyone who wants to walk out on Apple might find today’s the time. The unifying theme across every piece of hardware Google presented today was actually… software. Clearly, Google wants Assistant to feel as personalized as possible, and as natural as can be. Unspoken was the challenge to Apple’s Siri — “a lot smarter, but still kind of dumb,” as the WSJ recently described it. As part of his presentation, Pichai not only touted improvements to all of the deep, machine-learning Google has applied to understanding your speech, but also significant improvements in Google’s new machine translation systems. He highlighted in particular the context-based Chinese-English translation, which has already been pushed live to all users (you’d encounter it if you went to the website right now). It’s no accident that the show led off with Assistant; the software was the thread running through every other product and feature any executive announced, and Pichai spoke to the importance of that. Google, and its CEO, are pretty convinced that voice-led, friendly, talking AI is the future of computing. Hey, Look At Our Totally-Not-An-iPhone! What Google said is: hey! look at our new phone! What Google very, very carefully did not say, several times, is: hey, Apple users! Over here! We made your iPhone better! Pre-orders of the devices open today, and the phone itself will be shipping, and available in retail, on Oct. 20. Those Apple-challenging features also come with an Apple-challenging price point; models of the Pixel and Pixel XL run from $649 for the lowest-capacity Pixel to $869 for the highest-capacity Pixel XL, about the same range as pricing for the iPhone 7 and 7 Plus. 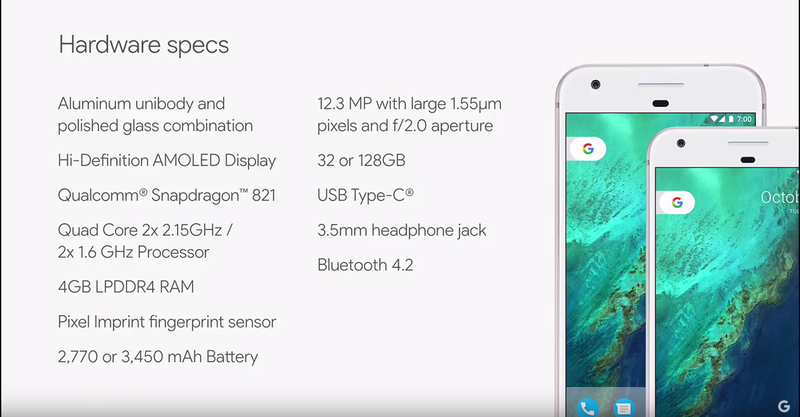 Google exec Rick Osterloh took the stage to introduce the new Pixel phone, which does indeed look exactly as leaks indicated it would. But most telling are the features Osterloh talked up before handing the presentation off to another executive. “It just works” was, for many years, the major selling feature of Apple products to consumers who might otherwise find themselves overwhelmed with the options and settings available in Windows — or, later, Android — products. By repeatedly touting the phrase “just works” and hyping up the physical design features of the Pixel, Osterloh is directly challenging Apple on its own turf. We see what you did there, Google. Rakowski also led a lengthy demonstration of the Assistant’s abilities to pull together immediate context and natural language in order to provide users with help. You can access it with a hold on the home button, he said, or pull it up at any time during phone use with its key word. And no, don’t call it Siri. 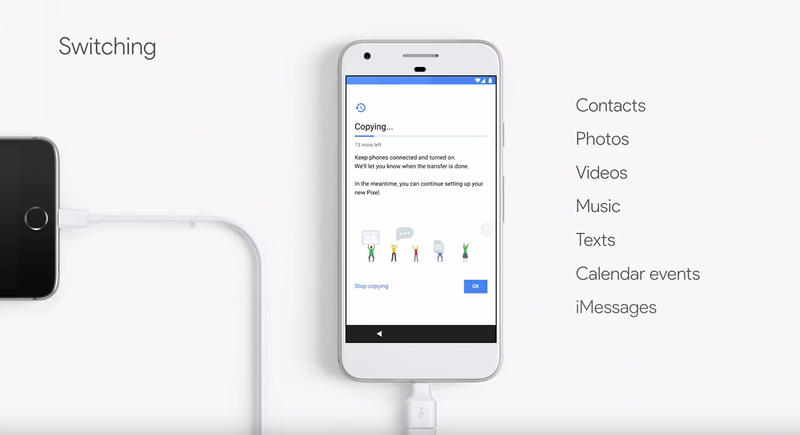 She then touted Google Duo, a video calling app that works “whether your friends are on Android or iOS” and “lets you jump into a call with a single tap,” before singing the praises of the improvements to the battery. Critically, Ellis also spoke to system updates on Pixel: owners of the phone will get automatic updates whenever they’re available, “downloaded and installed in the background.” All a user needs to do is restart the device. The fragmentary nature of Android system updates across device manufacturers and wireless carriers has long been the biggest security and usability challenge for the platform, so for Pixel owners the update is likely to be a welcome one. …and a pointed explanation that Google has worked hard to make it as painless and friction-free as possible for users, who might be so inclined, to jump operating systems from iOS to Android with a Pixel. Yes, even your iMessages can make the migration. The presenters also spent a great deal of time talking up virtual reality. 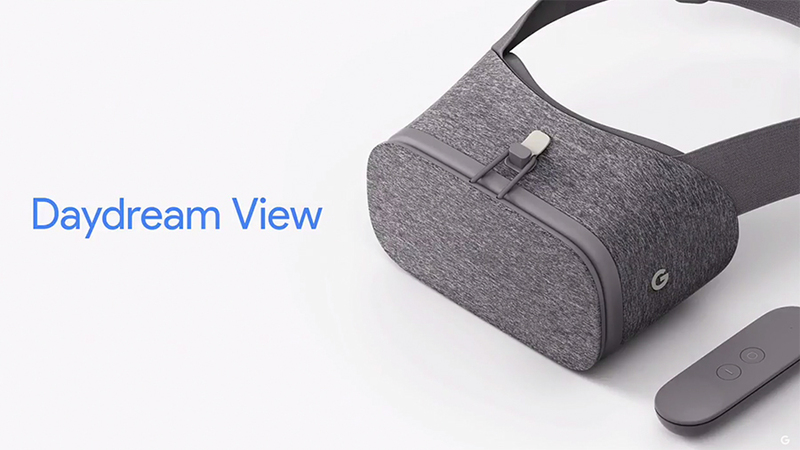 The company announced Daydream View, a new $79 VR headset powered by your smartphone. Google pointed out that in order for headsets to launch, they can’t look stupid or be uncomfortable. So in the vein of “comfortable and easy to use,” Google’s making the headsets out of… fabric. Exec Adrienne McCallister spoke to partnerships — that is, actual content from people not Google — already on tap for the VR experience. Because if there’s nothing to see inside one… why bother? And of course “sheep view,” a camera — on a sheep — in the Faroe Islands. Because why wouldn’t you leverage the shiniest new tech the world has to offer in order to hang out with wooly friends? 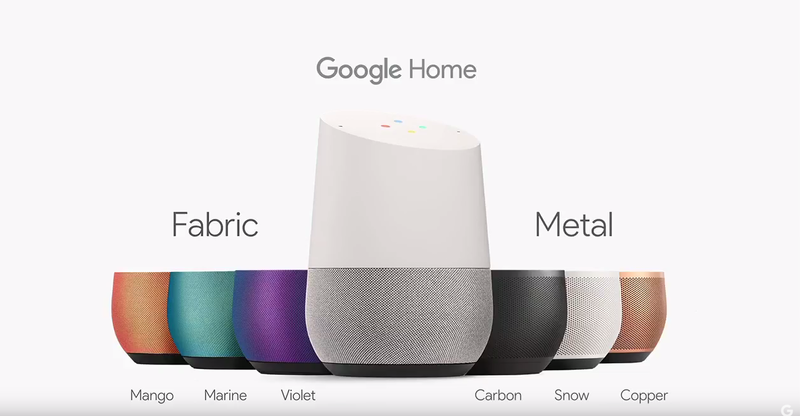 As expected, Google also finally announced Google Home today — but first, they led off with a whole bunch of other stuff it can connect to. First up was literally, the way you connect: Google announced its new router / home networking solution, Google WiFi. The unit is designed to look like a sleek, white, science-fiction hockey puck and not like a tech device, and is also meant to make managing your home connections quicker and easier. Exec Mario Queiroz showed how the WiFi nodes can be set up all over the house as signal extenders, or in just one place for smaller homes for improved coverage. “It’s modular, so you can get the right fit for your home’s shape and size,” he said. Next up was the Chromecast, which Querioz said has sold more than 30 million units to date. 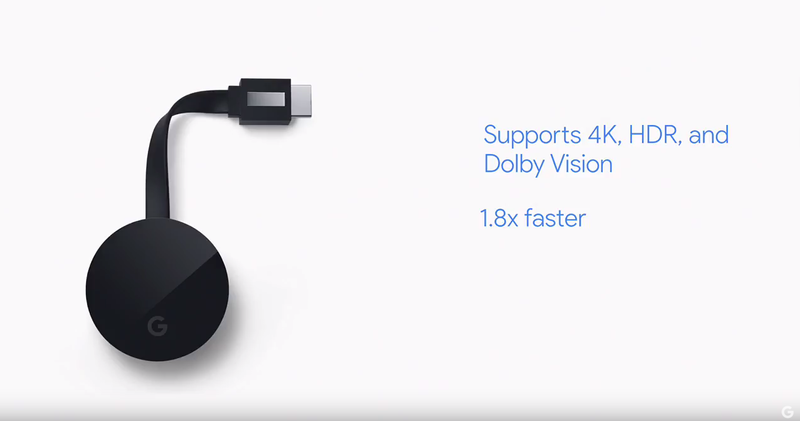 Google’s launching a fancy new Chromecast on top of the existing Chromecast and Chromecast Audio. The new model, Chromecast Ultra, will launch this fall for $69 and supports HDR display, Dolby audio, and 4K playback. And to make sure there’s 4K content to play back, Google Play Movies is rolling out 4K content this November, too. There’s a reason Querioz took his time to walk through Google Wifi and the new Chromecast before he got to Google Home: because the new product everyone was waiting for depends on those things, too. As expected, Google Home — powered, naturally, by the Google Assistant — can play your music or answer your questions based on voice command. That’s the bare minimum of what we would expect a smart-home hub to do, these days. And make no mistake, it is a hub. Google announced that in addition to Nest (a Google company), Home can control devices from Samsung, SmartThings, Philps Hue, and IFTTT. So yes, in that sense, walking into a room and announcing, “Lights!” is, well, more than a little bit of a Star Trek thing to do. Although you’ll have to tell the computer you want its attention, first; in addition to that slightly slanted top (“inspired by consumer products … like candles and wine glasses”) actually hiding a fully capacitive touch panel that lets you operate virtual buttons, Home also has a physical mic mute button on the back, so you can turn it off when you don’t want it listening for its trigger word. Here’s why Google made a point of announcing its new Chromecast first, though: The Home also controls Chromecast-ready devices. If there’s a Chromecast or a Chromecast Audio in your living room, and you tell Google Home, “Hey, play Stranger Things,” it will simply do so. YouTube playback is obviously supported and Netflix will also shortly support voice-casting, Google exec Rishi Chandra said; presumably, more companies could jump on board later. Home, like Google WiFi, is also designed to be in every room of your home and to be context-sensitive. If you have three of them and ask for a piece of music to play back, they will play it simultaneously. If you’re in the kitchen and ask it a question, the one in your kitchen — and not the one in the bedroom or living room — should be the one that answers. And of course, it all came back around to aesthetics again. The $129 Google Home, unlike Amazon Echo, comes in seven colors, and you can swap the bases out easily when you get bored of one and want another. Pre-orders start today and the device will hit retail on November 4.